On tha main DVD menu (where you can select special features, scene selection, or play all, I think), highlight Special Features, but don't select it. Press right on your remote to highlight the Shout! Factory icon. 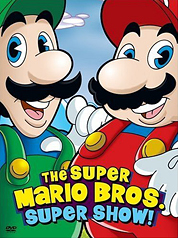 Next, press up to highlight Mario's mustache. Press enter, and a special clip should play.